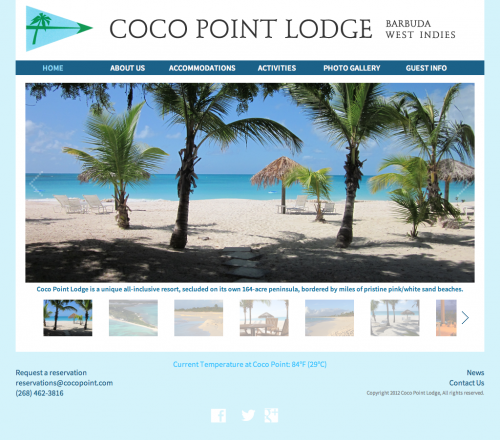 This comprehensive website replaced an outdated and incomplete site for Coco Point Lodge, a unique all-inclusive resort in Barbuda, West Indies. Samari Studios is responsible for taking nearly all of the photographs featured on the website, expanding and reorganizing the content, and completely redesigning and building the site. We helped advise Coco Point on marketing strategies for their customers (while still maintaining an unadvertised reputation) through email, Facebook, and Twitter. New postcards and new letterhead, as well as new behind-the-scenes technological advancements for the staff were implemented as part of this project as well.